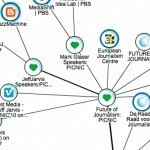 Ahead of the integrated storytelling session at newsrewired – connected journalism we’ve pulled together just five examples of the tools and platforms available to journalists to help them pull in content from across the web. On the day of the event (6 October) Xavier Damman, the co-founder of Storify, perhaps one of the most popular curation tools, will be appearing to speak about the possibilities the platform offers. You can buy tickets, which cost £130+VAT, here.